And the first AAU National Championship Record of the 2017 AAU Junior Olympic Games goes to... Akari Marshall of Boynton Beach Track Club. 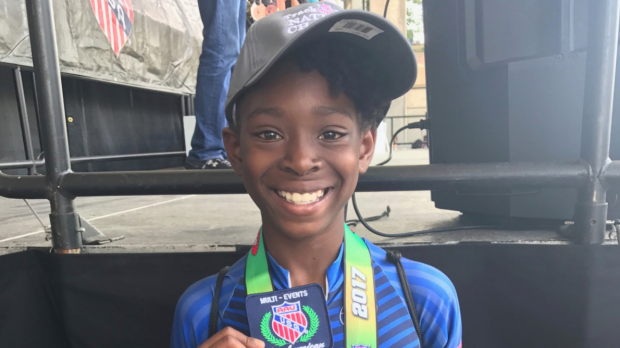 The nine-year-old triple threat from Lake Worth, Florida, broke a 13-year-old record in the girls age 9 triathlon Sunday at Rynearson Stadium in Ypsilanti, Michigan. She scored a total of 1,099 points for her efforts in the high jump (1.20m/312 points), shot put (5.25m/224 points) and 200m (28.88/563 points). The previous record of 1,063 belonged to McKenzie Stanford of Oklahoma. "Amazing," Marshall said. "I'm so happy. I didn't even know I broke a record!" D'Asia Duncan of the Central Jaguars also cleared 1.20m in the high jump and led the competition after the opening event as she had less misses than Marshall. But in the long jump, her teammate Payton Sirdine soared to an event-winning leap of 6.07m while Duncan managed just 3.91m. Marshall kept herself in the competition with a third-place effort of 5.25m, enough to move into the lead with one event remaining: the 200m. The speedster won the final event of the trifecta by almost a full second, clocking 28.88 (+0.8) to collect the event and overall triathlon win. Runner-up Arianna Thomas ran 29.70. "I just did what I needed to do," Marshall said. "I just kept it and I ran." Marshall is joining elite company. Stanford, the former AAU national championship record holder, went on to become a two-sport athlete at Oklahoma Christian University in track and field and basketball. She became the first female athlete in school history to be recognized as an NCAA Division II All-American in 2016 and then earned the award again on the basketball court after surpassing the 1,000-point career mark. Stanford is also one of only two women in OCS history to earn All-American honors in more than one sport, as she was named a National Christian College Athletic Association (NCCAA) All-American in 2015 in both basketball and track and field; she competes in the high jump and shot put. She has one more year of eligibility on the track team, which she will take while serving as a graduate assistant for the women's basketball team. Looks like there's plenty for Marshall to look forward to. The Girls Age 10 Triathlon AAU national championship record is tougher, and even older: Christie Leverette scored 1,402 points in 2000.